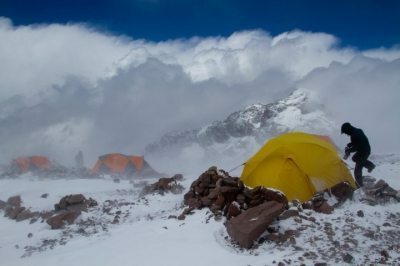 The tallest mountain outside of Asia, Aconcagua stands at 22,840 feet offering all inspired climbers an exhilarating experience full of physical and mental challenges. From hiking through the Vacas Valley, crossing flowing rivers lush from summer glacial thaw to cramponing snow fields above Camp 2 at 20,000 ft, Aconcagua offers it all! Join guides Karsten Delap and Lindsay Fixmer as they lead teams trekking through the beauty of an Argentinian summer in the mountains. Follow them on an amazing journey with breathtaking views, overcoming numerous. © 2016 Fox Mountain Guides, LLC. All Rights Reserved.